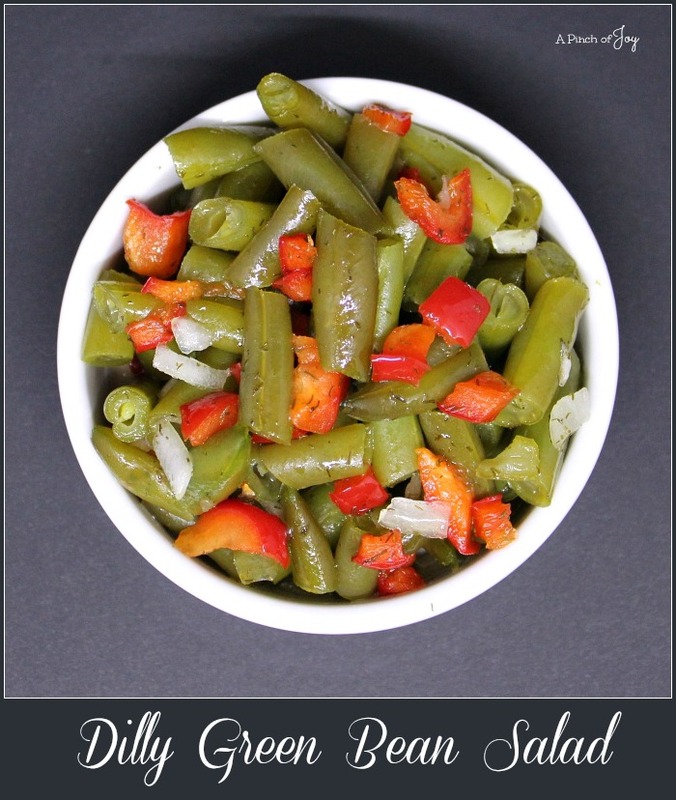 Dilly Green Bean Salad is a refreshing alternative to the usual three bean salad that’s a favorite at our house. 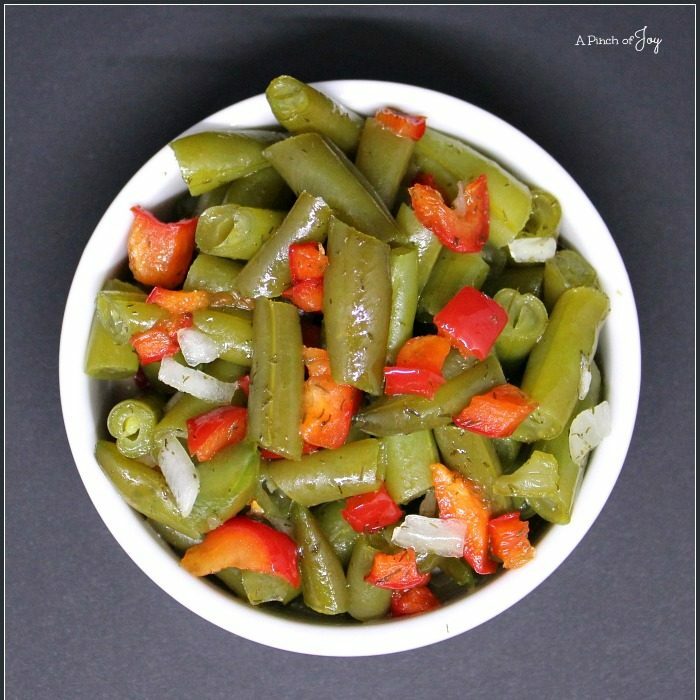 The deep green color of the cooked frozen bean contrasted with bits of white onion and red pepper are festive, appealing to the eye and the tastebuds! I first had Dilly Bean Salad when a friend brought it to a summer outdoor brunch served on our deck. The red and green also make it perfect for a Christmas meal. However, it’s delicious and colorful any time of year! When my friend Sue K gave me the recipe,she told me to use “extra green canned beans” and said they were located in a small section with the other beans. I did not find them while we were preparing to move because shopping time was limited. After the move, I didn’t find them in our new stores because there is a more limited selection. So – not to be deterred in the name of good food, I substituted frozen beans, which have a deeper green color than regular canned beans. I think they worked quite well. I use steam in the bag frozen green beans and subtract 30 seconds off the microwave time to make sure the beans stay firm. The two packages of frozen green beans make three cups of cooked beans. The original recipe calls for 4 cans of beans, which would make a total of six cups and serve 12. With that information, I cut the original in half to make 6 servings. If you want to serve a crowd, double the recipe given below and it will work just fine. Cooking the dressing keeps the ingredients from separating. Sue said she used fresh dill, but I used dried dill from the pantry. It’s 26 degrees today with four inches of snow on the ground and still coming! Saving my driving in the snow expertise – and hoping the city plows make it to the suburbs tonight — for the dentist and new crown tomorrow! This colorful salad is a festive and refreshingly different addition to a holiday meal, a summer potluck or just because . . . In small saucepan, whisk together vinegar, oil and sugar. Boil for 3 minutes. Add dill. Set aside to cool in refrigerator. Cook green beans according to directions, subtracting a minute or two from cook or microwave time so beans remain firm. Cool in refrigerator. Dice pepper and onion and set aside until the beans and dressing are cool, about 2 hours. Mix dressing, beans, pepper and onion together. Stir gently and do not overmix so as not to break beans or make them mushy. Let set in refrigerator 3-4 hours -- or better, overnight for flavors to meld. I like your adaptations,Charlene!! I didn’t really think of this for Christmas but it is perfect!! I am going to try the frozen beans sounds perfect and easier than looking for those special green beans. Glad you approve of the adaptations. I can’t believe it took me sooo long to accomplish this — but it was always in the back of my mind and never off the list. It will be on our Christmas menu by request. Everybody loves it! Wishing you all a wonderful Christmas! !